The two companies will offer radiologists access to various tools – for risk stratification, improved report structure, faster turnaround times – to help clinicans make better decisions about the next steps in the care process. In a partnership they say will help hospitals both improve the productivity of their radiologists and improve patient outcomes, Royal Philips and Nuance Communications will integrate their respective Illumeo and PowerScribe 360 platforms, applying artificial intelligence to radiology reporting. Nuance's voice-enabled platform accounts for a majority of real-time radiology reporting in the U.S. – as many as 70 percent of reports, according to the company. By combining PowerScribe with Philips' AI-powered Illumeo platform, the two vendors seek help health systems improve their radiologists' imaging reports by reducing discrepancies and improving accuracy and standardization. Illumeo informatics technology combines with PACS systems, bringing what Philips calls "adaptive intelligence" to equation to augment the radiologists' skills with contextual awareness and analytics tech. By bringing together the most relevant case-related information from various sources, the tool can help workflow and care consistency. "Providing rapid and efficient generation of high-quality, actionable reports is necessary to drive the shift to value-based care while continuing to manage growing volume," said Karen Holzberger, Nuance's vice president and general manager of healthcare diagnostics. "By accelerating the creation, access and usability of AI tools, the collaboration between Nuance and Philips will improve workflow efficiencies even further by reducing redundant tasks and helping better automate the reporting process," she said. In working together, the two companies will offer radiologists access to various tools – for risk stratification, improved report structure, faster turnaround times – to help clinicians make better decisions about the next steps in the care process, officials say. The companies note that AI-enabled imaging tools are poised to transform care processes and clinical pathways. For instance, lung cancer diagnosis and treatment requires data-intensive analytics and disease-specific workflows for clinicians. Automation technology can help identify problematic areas and communicate them more efficiently. Integrated systems using AI and contextual relevance tools can help health systems more to efficiently assess images and streamline their interpretation, according to Philips and Nuance, helping radiologists identify and follow-up with the most high risk-patients for faster treatment. 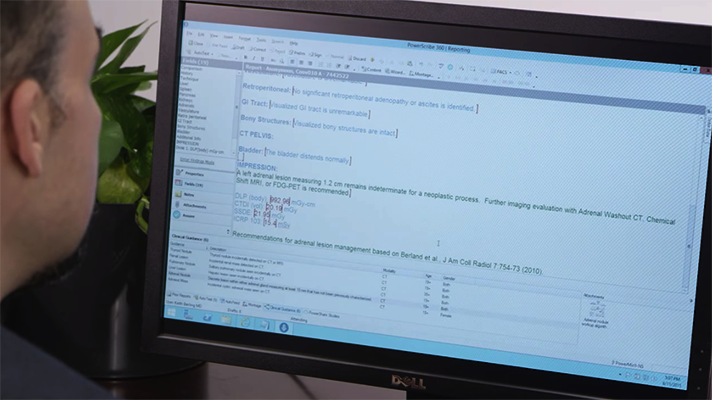 With this new integration, time-pressed radiologists "will have access to AI-driven solutions and practical applications, including the integration of ACR guidelines, to help save time and effort while improving report quality," said Yair Briman, business leader, healthcare informatics at Philips.